At the end of each month I will announce the totally optional theme for the following month. For the month of July 2012, the theme will be Round. *Focus on round shapes like the moon and sun in your work. *Create a round piece of art. *Work with an embroidery hoop. *Cover a page with teeny tiny circles. *Trace round shapes (cups, bottle caps, bowls) on paper and work within them. *Write about the roundness of the body. that Rumi poem put me in a great space – thank you! 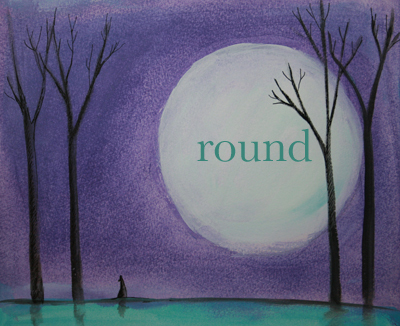 and Round – so full of possibilities! LOVE circles. Love your piece. Love this blog! Beautiful painting Leah! Draws you in to the thoughtful magic of its moonlit world. Cute thing to tell you: I just clicked on your site & then went to make a cuppa to sip on whilst I read. Meanwhile my 10 year old daughter, slipped into my vacated seat & went “Oooo I love this artist, she does beautiful paintings” then proceded to read your post She recognised your blog & remembered your art from when she’s explored your website before. Now on the subject of “round” – this is perfect for me and my obsession with creating mandalas! And yesterday I posted my latest pages for the “round” robin journal swap that is so inspiring. And yes there were some mandala doodles included on these pages, lol ) Perfect!! Hope you and your lovely family are all well & happy. So excited by this month’s theme. I’ve been using a lot of circles in my painting lately. Happy July! Round was the perfect shape to the Ancient Greeks. I always think of cycles, when I think of circles. It is amazing and reassuring. I may have taken the prompt a bit out of the box. The picture in the blog shows how “round” I was when I weighed almost 300 lbs. What a wonderful addition this book will be to the daily creative “spark” you offer to us all! Especially for artist/writers like me. Your Creative Every Day themes have kept me connected to my inner world during times when I would otherwise have certainly lost my way. Thank you so much for all of the gifts you share!